Welcome to the Astonishing Secrets series of Dr Liz. Through this series, we hope to offer information and help you help your pet until you are able to get them into your regular vet. "I see a mite in there"
When you have a relationship with your vet, then they, like us, will do all that they can to help you and pet at any time. When ears get itchy, our pets can do things like scratch at them, or head flap from side to side. Ears should never have any discharge (or at the very least, a small amount of waxy material). Anything that looks liquidy, black, gooey with or without blood, is not normal, and needs immediate attention. There are many pets who are often so stoic that we do not see any of these signs, and it is only when the discharge from the ears is obvious that a pet owner is aware. How often do you check your pet's ears? We recommend each week at the very minimum. How often should you clean your pet's ears? This can differ from pet to pet, but can be weekly, or after a bath or swim. is needed to see the horizontal component. Many pet owners are not even aware that their pet has a problem, until they visit their groomer, who may diagnose "ear mites" or an "ear infection". 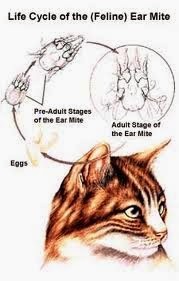 Ear mites are common in young animals, and in those animals who have had contact with young ones. However, the discharge and signs they produce can look exactly the same as a yeast infection, and to confuse things further, many pets often have both yeast (malassezia) and ear mites at the same time. This means that many owners often go to the pet shop to pick up ear mite drops but find they are disappointed when their pet continues to suffer. Malassezia yeasts look like purple coloured peanuts microscopically. 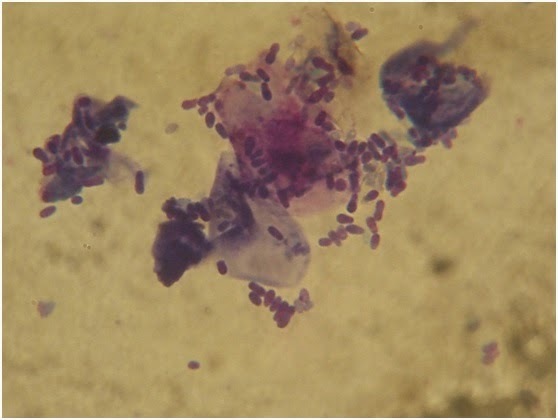 To diagnose both types of infections does require a veterinary visit, as we perform a microscopic examination of the ear discharge (to see the mites), and cytology also - to look for bacteria and yeasts. The ear drops needed to treat Malassezia (yeast infections) is a prescription medication only. The treatment for ear mites is available over the counter. 1. Your pet's ears need to be cleaned. We recommend the use of PAW Gentle Ear Cleaner. Syringe in the ear cleaner, massage for a minute, the remove the debris. Allow the ears to dry for 15 minutes. 3. 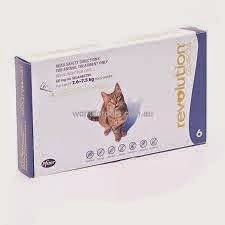 Apply Revolution spot on (the cat one for cats, the dog one for dogs) onto the back of the neck. Repeat each 2 weeks for three doses. Revolution Spot On by Pfizer. 4. At some point during this six weeks, your pet will need to have the ears tested to check that the Revolution has killed the ear mites, as well as stopping reinfection (from the eggs that are laid), and to make sure that any other underlying ear infection is identified. 5. If a yeast infection is identified, then your vet will dispense effective prescription medication. A little tip: To treat mild yeast infections in the ear, or to prevent recurrence, you can use Otoflush ear cleaner by Dermcare. Lives: Usually in the ear canal, but lays the eggs in the discharge, and also on the hair around the ears. Life Cycle: Eggs hatch within 21 days of being laid, hence re-infection is common if treatment is not of sufficient duration. How it irritates the ears: They have long hairs on the end of the legs, and this causes a "tickle" as they burrow through. Picture Reference from: http://vetnetwork.net/ext_clients/anasazi/pca.php?article_id=108 Accessed 4th January 2015. Treatments include: Revolution (Pfizer) and Advocate (Bayer). 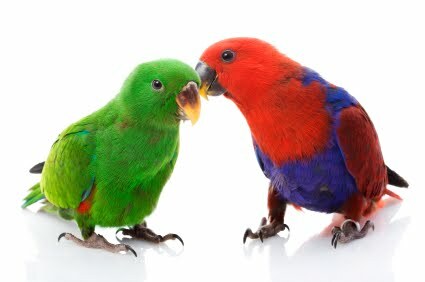 I am Dr Liz, the vet from Russell Vale Animal Clinic, in Wollongong. 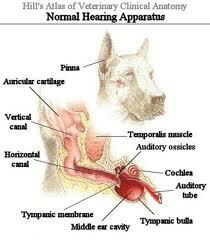 Do you have any questions about your pet or their ears? Feel free to add comment or question below.